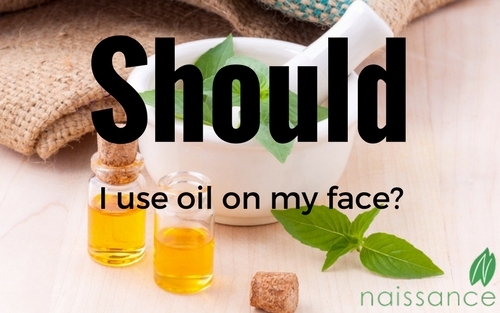 Should I use oil on my face? And, the four top natural organic oils if you choose to take the plunge. I have been using a well-known brand of moisturiser for many years, it's expensive and it leaves my skin soft and matte, not oily. I don't want oily skin. Why would I change and put natural oil on my face? Oily oil. Well, for the first time I turned the moisturiser round and looked at the ingredients - there are a lot of ingredients, they are not all natural and, it turns out, not all necessary or good for me. I looked at the natural oils, I looked at their ingredients, there is only one main ingredient, the oil. Oils that naturally contain vitamins and essential fatty acids, oils that are natural moisturisers, which do not contain any man-made chemicals. Oils that don't make your skin greasy! Oils that help balance your skin's sebum production, making it less greasy. Oils that have, often for hundreds of years, been successfully used to improve skin condition and appearance. Oils that do not cost the earth. This is why I now use oil, on my face, my partner uses it on his face, I do not inwardly scream at him for this because the oil costs less than £10 not over £30. The natural oils listed below are renowned for improving the appearance of your skin, in many cases making it less oily! They may improve the look of spots, blemishes and the wonderful marks of ageing - or signs you are wise and wonderful. They are a 100% natural way to moisturise your face, free from everything apart from the natural oil itself. There are so many oils that are good for your face, but we've picked our top 4. What are your favourites? Let us know in the comments below. A favourite of celebrities and royalty, this sun-kissed oil is a wonderful tonic for the skin. Renowned for improving the appearance of fine lines and wrinkles. Rosehip Oil contains Omega 3,6 and 9 and helps create a healthy glow. Considered by some to be the Rolls-Royce premium carrier oil, ideal for all over moisture, including hair conditioning. Suitable for all skin types, Jojoba oil can also be used as a cleanser by putting a small drop on a cotton wool pad. It can be used as an oil for massage letting your hands easily glide along the skin. It is also reported to make the skin less oily as it mimics the skin's own sebum, making it less likely to over-produce, which may make your skin oily. Some people who suffer from acne have found Jojoba oil to be beneficial. Moroccan gold, Argan Oil has been highly prized for centuries by the local people and now the Western world is celebrating the benefits of this wonderful oil. Used for all over body moisturising, and many use it to help rejuvenate, invigorate and nourish their skin. Helps hydrate your skin. A great moisturiser which many people use during the winter months to combat dry skin. Liz Earle made a combination of Argan, Rosehip and Avocado to make a face moisturiser on This Morning, but it can be successfully used on its own. We also have food grade avocado oil for eating and cooking with. You can buy all of these beauty oils in small or larger sizes. Even the 30/60ml sizes go a long way and the organic, Soil Association Certified range starts at £6. These are our favourite oils we've chosen with you in mind but you may have other ideas. If you have, don't forget to let us know.